NEW YORK ( TheStreet) - Looking forward to a vacation? A warm beach, freshly powdered mountain, long romantic dinners, rounds of golf, wild nights of dancing or hours of reading by the fire...Getting away for the holidays can be the best gift of all. But vacations around the winter holidays usually involve more family time than some are used to spending. And, as adorable as those little cherubs can be when all is merry and bright, there is bound to be a moment (or two) when mommy, daddy, auntie, or grandpa needs to unplug. Fortunately, an Apple ( AAPL - Get Report) iPad is easier to pack and port than dolls, toys and board games. And chances are that your kids will enjoy the expensive device as much as you do. According to a Nielsen study earlier this year of tablet-owning households, 70% of children under 12 use the tablet. 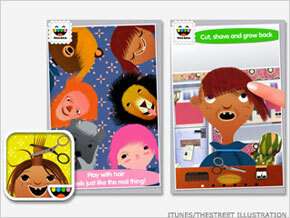 With Toca Hair Salon, children 3 and above can play stylist for six charming characters. Harry, Berry, Mary, Rita, Larry and Fuzz react with sounds and expressions as kids shampoo, towel, cut, dye, blow-dry and style their hair. Select the G.R.O. potion, and their hair grows back again. With this entertaining app, the risk of becoming a beauty school dropout is slim. Available for $1.99, this app is compatible with iPhone, iPod touch, and iPad, but requires iOS 4.3 or later. Children can become book publishers with Scribble Press. This elaborate app offers 50 themed templates with illustrations and hundreds of markers, stamps and stickers to make storytelling easy for a range of ages. The app prompts users to select cover art and a border, apply stickers, input a title and an author and off they go! Perhaps with their parents' help, youngsters can add text and comic bubble language, upload images or photos to create a book. Or, with a single image, users can also create customized puzzles or greeting cards. The most rewarding step, of course, is publishing the masterpiece to the public Scribble Press Book Gallery, sending it to loved ones through email, Facebook ( FB - Get Report), Twitter or Pinterest, or ordering a printed copy. For an additional 99 cents, parents can download the Holidays Story Pack to serve as a festively-themed journal for the upcoming holiday vacation. The package offers one new story with audio for non-readers, 27 thematic stickers and 3 additional backgrounds. Available for $2.99, this app is only compatible with iPad and requires iOS 5.1 or later. Cupcake Maker lets kids enjoy baking without creating a mess. The process is realistic, starting with a selection of cake mixes. Then, children have to add the ingredients, stir the batter, select six cupcake tray liners and watch the cupcakes bake. The final treat is decorating the batch. Children can select a frosting color as well as thematic toppings, candies, nuts, sprinkles and candles. The menu of options is extensive, but for those craving more, there are decorating materials available for sale in the "Supply Store." This free app is compatible with iPhone, iPod touch, and iPad, but requires iOS 3.0 or later. FarmYard Piano provides an amusing audio-visual experience for the tiniest of tots. Babies can simply select pigs, cows, sheep, ducks or animal chorus from the barnyard to play oink, moo, baa or quack on the 7 notes of the music scale. The popping animals and strange noises are bound to distract a crying baby. Available for 99 cents, this app is only compatible with iPad and requires iOS 4.0 or later. With only a one-finger touchscreen control and two game modes, Tiny Wings is simple, but addictive for all ages. While listening to soothing sounds, players input their name, and then, an introduction sets the stage: "You have always dreamed of flying - but your wings are tiny. Luckily the world is full of beautiful hills." By touching the screen, players can help the small winged bird gain momentum when sliding down the hills. The bird soars from island to island, collecting coins. Flight School, the game mode that offers 15 levels, features four baby birds racing across the landscape to their mother's nest. There is also a two-player mode, which allows two players to control their birds on opposite sides of the same screen. Available for 99 cents, this app is compatible with iPhone, iPod touch, and iPad, but requires iOS 4.3 or later. It is optimized for iPhone 5.